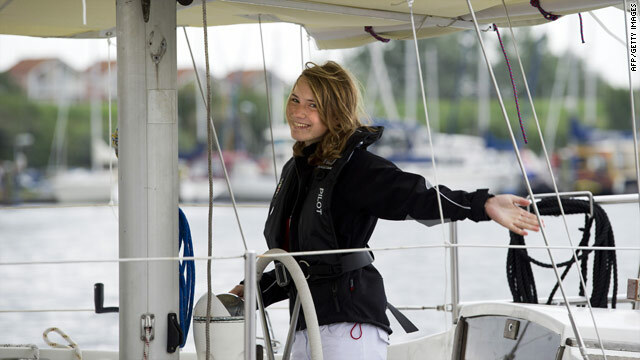 Laura Dekker, 14, waves goodbye as she leaves the harbor in Den Osse on August 4, 2010. (CNN) -- A 14-year-old Dutch girl set sail Wednesday morning on a journey to travel around the world. Laura Dekker left her home port of Den Osse at 9:10 a.m., her spokesman Peter de Lange confirmed. "She will arrive in Portugal, near Lisbon, in two or three weeks," de Lange said. "She is traveling in her yacht, Guppy, with her father until Lisbon where she will start the official solo sailing trip around the world." Dekker's attempt to circle the globe hasn't always been smooth sailing. Last August, Dutch authorities placed Dekker under state care for two months after her parents refused to prevent her from undertaking the potentially dangerous voyage. Last October, a Dutch court ruled against letting Dekker sail solo around the world, saying she is not experienced enough to make the trip on her own. However, she would be allowed to travel this year if she fulfilled certain requirements the court established for her to sail. Dekker is seeking to become the youngest person to sail solo around the world.